Why did Samson die and not Delilah? Why did Romeo die but so did Juliet, right? Why did Jack die when he could fit on the door with Rose? Why was Edgar Allan Poe able to write poems for a dear Annabel Lee? What happened to Annabel? Did she write back? These questions bugged me as a kid and since I was able to realise that an iceberg is actually a giant ice that makes oceans really cold. The picture above gave me an idea of what to write about. While this piece is funny it is well, also somehow flawed. So why do Princes battle dragons? Why do Princesses end up in a tower? Is Annabel Lee real? Is she an imaginary girlfriend? Is Annabel Lee even a girl? Because you know, I used to name my diary Edmund and the snoopers thought I was writing letters to a long distant guy and the search went on about who Edmund is and haha! You know what happened after that. Growing up, I was exposed to superheroes being males and then there was Wonder Woman and then The Powerpuff girls and some others from Disney Channel or Cartoon Network. But when it comes to classic and traditional literature, it is always the guys: Prince Charming, King Arthur and the Knights of the Round Table. And the girls aside from being pricked and sleeping for hundreds of years and being stuck in a tower, are also the evil queen who puts everyone’s life in peril. The guys are the heroes, and us women, are represented as the evil queen, or the queen who died after giving birth or the damsel in distress. Nothing more significant. But how did this come about? Our classic literature reflects how our society was: patriarchal and phallic centred. It was believed that a woman’s role is determined to be domestic only hence, exclusive. This means that if women would write, they could only write about their experiences which included giving birth, menstrual periods, and housekeeping which cannot be understood by the general reader that of course, refers to men. While men are more exposed to business, travel, and adventure, and women are confined within the homes, and while economic literatures are more interesting to counterparts that have not experienced anything related to that of the writer, a woman’s experience cannot be more relevant. I crumple to contraction rotations for thirteen hours before the doctor finally gave the good news: that I am ready to deliver my baby while experiencing the feels of what seems like a hundred bones breaking at once for another hour or more. What good would knowing about giving birth do to my business or excitement to travel? Yes, that is more likely the reaction you would get. Putting all this into equation, we can say that most writers in the classic era, if not all, are men. And in a society where more prolific characters are male, women don’t stand a chance especially when they don’t have more qualifications in terms of education and training. And since writers are men, our literatures are more biased to a man’s perspective. Given that, a woman superhero could rarely exist. Because who can better write about women but women themselves, correct? However, one interesting idea in the feminist discourse is that women are actually the driving force behind every man’s heroic adventure that includes saving a screaming and ever distressed damsel. In most literature, the protagonist women do nothing but just exist. Word per word that is a woman doing nothing to seduce or to lure a man. Her mere presence charmed him into liking her while she was just fetching water from a well or singing while cleaning the garden. Everything starts with love at first sight. Suddenly, he is Romeo, he is Jack, he is The Knight, The Protector. He is also the story teller thus, able to express his struggles, adventures, and how he came about but none represents her voice, her emotions, her perspectives. While men are louder when it comes to their pursuits about love, women quietly have struggles too. You could read a man write I dashed to the castle, battled the dragons so I can save her but no olden literature would expose her world when she says, I made myself loyal to him, I patiently waited by the castle window for when he would return and for me, no other man can equate to him. Back in the day, men were more privileged to contribute and to allow literature to prosper and only after about a century that women were allowed to enter the picture. If circumstances had been different, I could be sure that Annabel Lee could have written back to Edgar Allan Poe and Anne Hathaway wouldn’t just be Shakespeare’s wife but she could have been The Sonnet Queen. And when Rose of Titanic died an old woman warm in her bed, she did die for love. Why? Because that was Jack’s dream for her not to die that night and she lived long enough to fulfill it. You will die an old woman, Rose. Warm in her bed. 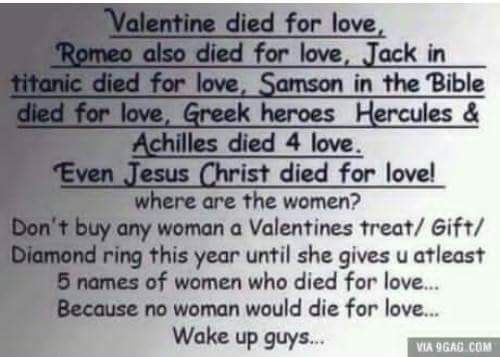 So, no women died for love? Nah, we just knew other ways of sacrifices. The kinds you don’t read from books nor see from the movies.